The year is 2017, and an employee at an assisted living facility in Wilmington, N.C., that houses mostly white residents thought it would be a good idea to include a picture of a mammylike character in the December calendar of activities because white and unabashed racism is still alive and well in this country, whether y’all want to admit it or not. 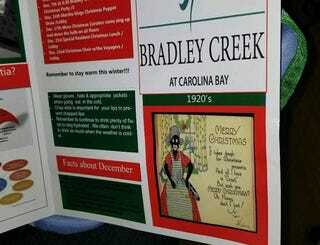 Although all copies of the calendar have reportedly been removed from the facility, Bradley Creek, the local and state chapters of the NAACP are calling for immediate action. Two black staff members were offended by the calendar and reportedly complained to management. One of them took a picture of it and sent it to the Rev. Kojo Nantumbu of the North Carolina NAACP, who in turn gave a copy to the Journal. Jackson was later suspended by the facility for what it called a “resident complaint” that she says she was not aware of. She speculated that she was suspended because management found out she was the person who had taken a photo of the calendar and shared it outside the facility. Activity Director Jennifer Dicicco Alaimo, who is said to have been responsible for the calendar, was reportedly fired after the story made the local news. Meanwhile, Jackson has decided that she no longer wants to work for the facility and is currently seeking employment elsewhere. Read more at the Wilmington Journal.